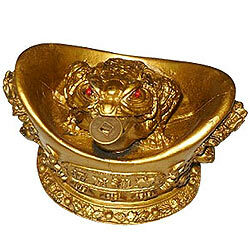 Money Toad Statues are auspicious symbols of good fortune. It is said to be most conducive to attract wealth. This Frog on boat toad with a coin in its mouth, which is sitting on the Ba Gua, is used to bring wealth and prosperity ( The Ba Gua here is the symbol of balance).Place it near the front door, positioned in lower level but not on the ground.